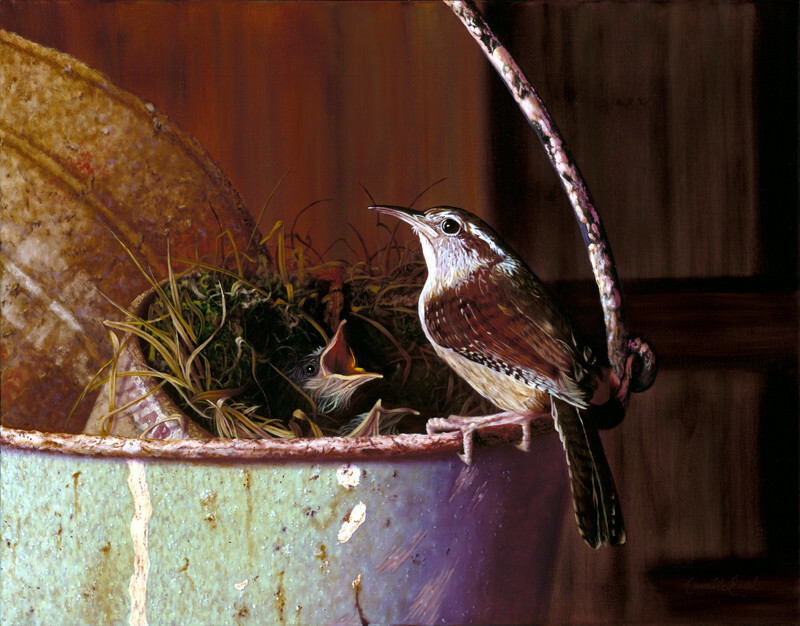 This is Camille’s first bird painting depicting a contemporary realism bird painting depicting a Carolina wren perched on the edge of a rusty bucket feeding babies... faded Folgers coffee can in background. AWARD & PUBLISHED: 2015 “Animal/Wildlife Finalist” The Artist’s Magazine 32nd Annual Art Competition (from 2100 entries). PUBLISHED: “Nashville Arts” magazine, August 2014, “Camille Engel: When Paint Starts to Fly” 3-pg article. AWARD: 2006 “ARTISTS’ CHOICE" Award, International Guild of Realism, Manitou Galleries, Santa Fe, NM.